You might think that this is obvious, but when you have a healthy body, you also have healthy, great looking hair. When you get sick, have a cold or the flu, your hair is a perfect reflection of your health. Often, people notice your hair looking horrid, before they know you are ill. When it comes to hair growth, around 90% of the hair on your scalp is in a “growing phase” which can last between 2 to 6 years. During this phase, each hair will grow around 1cm each month. Not being well, can affect this growth pattern, leading to slow growing hair or even hair loss. The other 10% of your hairs are in a “resting phase” and after 2-3 months, they will fall out and (hopefully) a new hair will grow in its place. As you will know, it is normal to lose some hair each day, when brushing or washing for example and these are hairs that are in this dormant cycle. However, it is also possible that you might get excessive hair loss if the balance between the “growing” and “sleeping” phase becomes unbalanced for any reason. Let’s look at some of the reasons around hair loss, some causes, treatments and tips for keeping your hair and preventing any further loss. Hair loss facts and fiction. Losing up to 100 hairs from your head each day is quite normal and is just the scalp shedding the old hairs to make way for new ones. Using shampoo and conditioner more frequently does not cause hair loss. Wearing a hat on a regular basis does not cause hair loss. Plaiting, braiding or having hairstyles that are “tight” can cause hair loss. Regularly blow drying your hair can worsen hair loss, due to the heat. The sun can also cause the same damage over time. Your hair only grows about 1 cm a month. Every hair on your head will grow for about 3-6 years before dying and falling out to make way for new growth. Stress – This is quite a common cause of hair loss and although usually temporary, stress can be the trigger for people to begin to lose their hair. This stress can be physical or emotional. I am sure you have heard the saying, where peoples hair “turns white, overnight” – which can usually be attributed to stress. Women who use oral contraception pills can be prone to hair loss, if used excessively. Hormones – If the male or female hormones are not balanced in the body, this can lead to and increase in hair loss. Women who have recently given birth can also notice hair loss as the hormones in their body have undergone such a huge change. Your diet plays a huge role in the health of your hair. If you are deficient in any vitamins or nutrients, such as protein, iron or zinc, your hair growth and health can be affected. Too much fried or oily foods, spices, tea, coffee and alcohol can hinder any “good nutrients” getting all the way to your scalp and hair follicles and may lead to premature hair loss. Common drugs and medicines can cause hair loss. Especially ones that are used to treat cancer or depression. Some hair conditions can be hereditary and have been passed down through the family to you. Unfortunately, these are usually unavoidable. Any sort of fungal infection of the scalp can cause hair loss, especially if not treated quickly. Unfortunately, increased hair loss is a normal symptom of getting older. 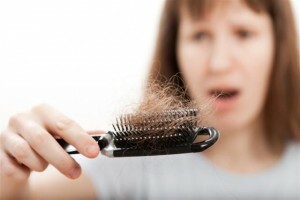 It is all dependant on the type of hair loss you are suffering from and also any underlying or external cause. For example, if your hair loss is related to medication you are taking, a simple visit to the doctor or a change in the medicine might be an easy fix. Getting the right diagnosis quickly, along with treating any scalp infection may help prevent any further hair loss. This is the same if your body is out of balance hormonally – correcting any problems in this area may also prevent any further hair loss. If your hair loss is due to an external problem such as if you are taking drugs or have any vitamin/mineral deficiencies, you can be rest assured that it will stop when this cause has been eliminated or treated. If you have any infection of the scalp, your hair loss will only stop when the underlying problem has been treated. It is important to have this treated as soon as possible to prevent any permanent damage. There are many shampoos and hair treatments that promote a healthy and stimulated scalp. These products do work (although the results do seem to vary) and there are many different types available. See our article on our pick of the best shampoo for hair loss products. If want to hide, rather than treat any hair loss, or look great whilst it is being treated, chose a hairstyle that is good at hiding thinning hair. Your hairdresser will be able to advise you best on this. If you have severe hair loss, you may want to think about using a wig. Modern wigs look amazing and very realistic, so there is no need to worry that you are going to look strange. Hair transplantation is a more expensive option which has improved over the years. If you can afford this sort of treatment, it can be very effective, with hairs transplanted into your scalp to promote new growth. It’s a bit like planting a new tree in your head. Our top tips for beautiful hair. The key to having and keeping beautiful hair is to have a very clean scalp. If you are looking for a natural way to help your scalp pores stay clean, try gently rubbing lemon juice into your scalp and then leave it in for around 15-20 minutes before rinsing off. Calcium is great for hair and you should make sure you include it in your diet. This can be as simple as increasing the amount of dairy products, eggs, cheese, milk and other foods such as sesame seeds or figs. Avoid using man-made chemical type shampoos and conditioners. It is better to use natural shampoos that will not strip any oils from your hair, which might leave it brittle. Try to avoid regularly exposing your hair to harsh weather such as strong sunlight for any long periods of time. If you suffer from dry hair, try increasing the intake of natural oils such as polyunsaturated sunflower oil or margarine and try eating foods that are rich in Vitamin B.